Prince released two new albums Tuesday -- his first studio works since 2010. Prince released "Art Official Age" and "PlectrumElectrum" Tuesday. 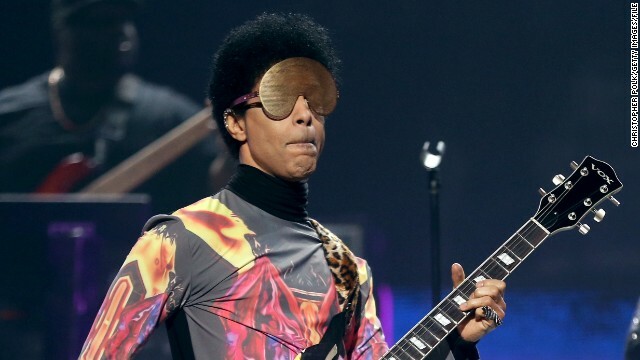 (CNN) -- Prince is back in a big way. The legendary musician is putting his reclusive reputation to the side to celebrate the simultaneous release of two albums out this week: "Art Official Age" and "PlectrumElectrum," his first studio albums since 2010. "Art Official Age" is being billed as Prince's latest solo effort, while "PlectrumElectrum" is the first release from his band 3rdEyeGirl. The former is described as a classic Prince album: "A contemporary concoction of soul, R&B and funk," a recent press release said. The latter is a live band record, featuring the musician surrounded by three female rockers. The hitmaker kicked off the week with a party livestreamed on Yahoo Tuesday night, his only scheduled performance surrounding the release. Rapper of the moment Kendrick Lamar joined the Purple One on stage, and the event included a rare tour of Paisley Park, Prince's legendary studio complex, where most of his recording over the years has taken place. The 90-minute event only contained three live performances, however. Prince also sought a greater social media influence, joining Facebook Tuesday to host a live Q&A with fans. The star might not have a full grasp on the requirements of being social online: It took Prince three hours to begin his answering duties, and he only ended up responding to one question. Prince now has 34 albums under his belt, but that doesn't mean he can't use the extra push. The "Purple Rain" star hasn't had a platinum album since 2004's "Musicology," and hasn't had a song break the Top 40 since 1995. But he has been a consistent touring artist, and appears to have used 2014 to get his brand back into the pop culture consciousness. Indeed, he's been pretty un-reclusive so far this year. The Grammy winner kicked off the year with a guest star stint on the post-Super Bowl episode of "New Girl," even releasing a duet with the show's star, Zooey Deschanel. The appearance was followed by a sold-out European tour and a headlining gig at the Essence Festival in New Orleans in July. The release marks Prince's return to Warner Bros. Records, which released many of the star's early hits. It was that break-up that sent the musician to change his name to a symbol moniker. Prince now owns the masters to his Warner Bros. recordings in a deal he was able to work out with the label. "Art Official Age" and "PlectrumElectrum" are both available for streaming on Spotify.